At long last, Infinix Mobility has unveiled the most anticipated devices called Infinix Smart 2 and Smart 2 Pro. 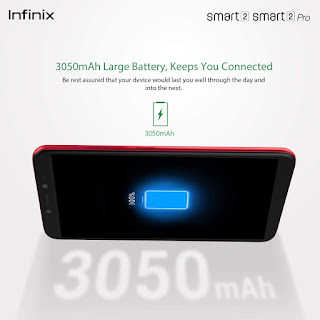 These phones are coming after the company launched Infinix Smart device last year, 2017. 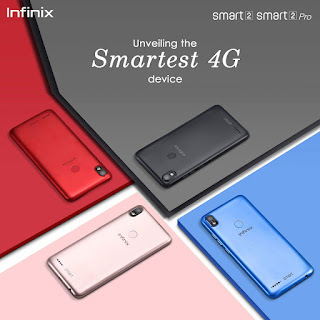 The new Infinix Smart 2 and Smart 2 Pro features a dual smart standby 4G LTE SIM with Face unlock and Smart fingerprint sensor for device security. They both spots a 5.5 inches FullView display, coupled with a smart 3050mAh battery capacity. Looking at both phones, the noticeable difference between them are the RAM size and Camera. No doubt both phones looks alike in terms of design and appearance. The battery makes it boring. Something like 4000 mah would have been better. Admin pls help, i reload my infinix hot2 using the power button and volume key, but when reloading (startup) am always stucked in a step requiring wifi network to load the next page after selecting the language....... Pls what can i do?? What do you mean by reloading? Did you flash the phone? I guess that phone has been soft bricked, you need to flash a new stock ROM to the phone. The two phones are good having good RAM and ROM, thanks for this post.